The target was to speed up the rolling process with existing mechanics of the rolling mill and to improve quality of rolled out material. Our part was to redesign original functions and prepare the software for Logicad platform for finishing mill entry area. This system is designed to cut rolling material and remove the cutted scrap. The system which is providing and controling removing of scale from incoming slab to the rolling proccess. The right amount and pressure of water together with the right distance and angle of spraying nozzles is providing the clean surface of slab before rolling proccess starts. The system controling all hydraulic valves for positioning of side guides leading the head, body and tail of slab to the right centre line for rolling. This part contains the control of all necessary drives to move the slab forward. This control includes functionality of low pressure hydraulic systems and grease and oil lubrication system systems. The system for tracking material head and end in steckel mill and finnishing mill area. For controling of rolling process is necessary to know exact positions of strip head and end to be able to set the right devices to right positions at the right time so this system calculates them, synchronize them and cooperate with Rolling sequencer to support the best controling of rolling process. According to strip positions this system sends positioning requests to all devices in steckel mill and finishing mill and controls and synchronize all movements during rolling process. This integration test was done in Germany at SMS Group GmbH company. 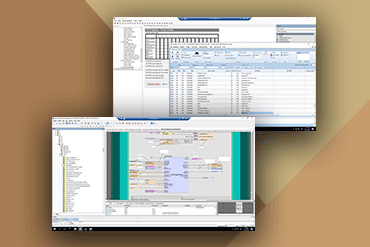 Our parts of project software were merged together with the rest of the project software and tested all together. The main point of the integration test is to simulate whole technological entity and test all programmed parts together to reduce the commissioning time at customer. The commissioning was done at ultimate custommer in Russia. The main supplier of whole technology and master of whole commisioning was the SMS Group GmbH. The commissioning included hw signal check, movements check and optimalization of control loops, manual and automatic function check, production start and support.